Not every state has a national park. For instance, if you don’t count the sliver of Yellowstone that Idaho has, Idaho has no national parks. A total of 28 states have national parks as well as do the territories of American Samoa and the United States Virgin Islands. California has the most (nine), followed by Alaska (eight), Utah (five), and Colorado (four). 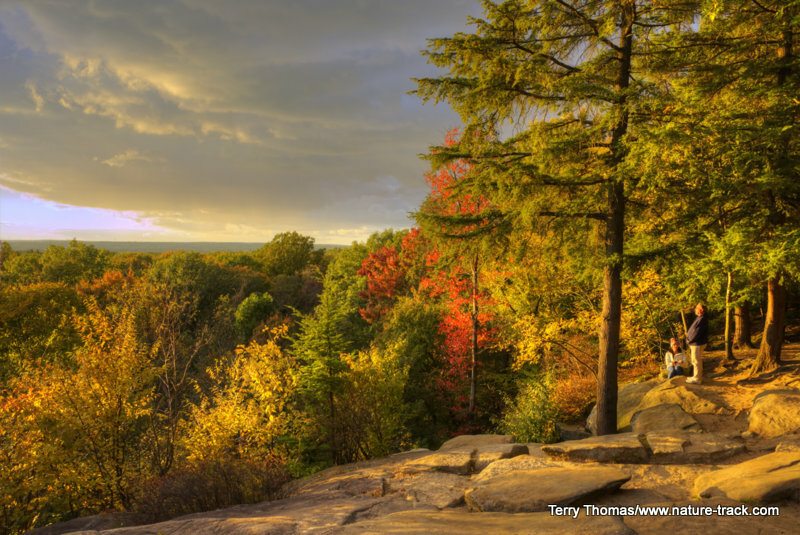 It may seem a little surprising then, that Ohio is counted among the lucky 28, with Cuyahoga Valley National Park just south of Cleveland and Lake Erie. This isn’t a large park, but there is no entrance fee and there is plenty to do. 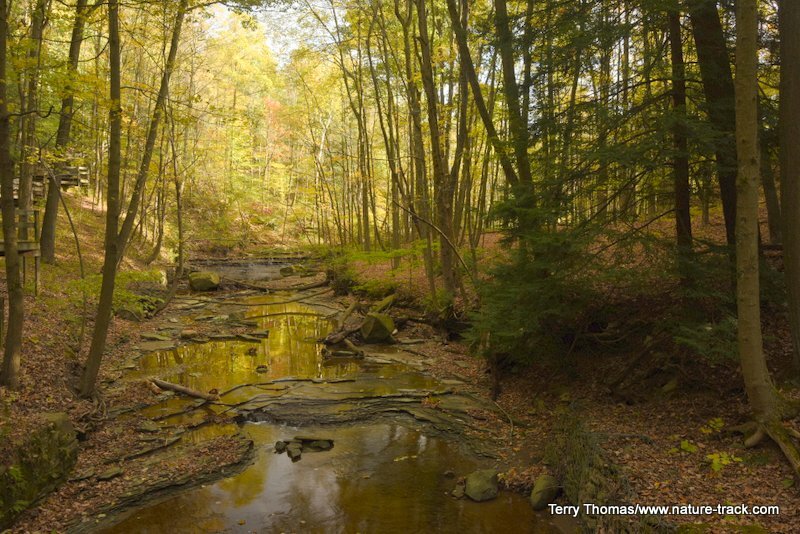 We were in the Cleveland area in late October for a photo workshop and decided to take several days to explore Cuyahoga ( pronounced, Ky Ya Hog A). We started with a quick visit to the Visitor Center near the tiny berg of Peninsula. There we discovered that this park is big on history, and most things build around that. The history here is of the Erie-Ohio Canal, an extension of the more famous Erie Canal in New York. This canal ran from Cleveland to Akron, Ohio through a series of locks that raised the boats a total of about 350 feet in elevation north to south. This is one of the remnants of the actual Erie-Ohio Canal along the Towpath Trail. Since this was a canal that depended on mule teams to pull the boats, there was an accompanying towpath on which the mules walked. The canal was finally abandoned in March 1913 when 9 inches of rain in a single spring day washed out so many infrastructures that re-building was impossible. This is one of many locks along the canal. It could raise a canal boat up about 15 feet to continue the next leg of the journey. For many years, the canal was all but forgotten. 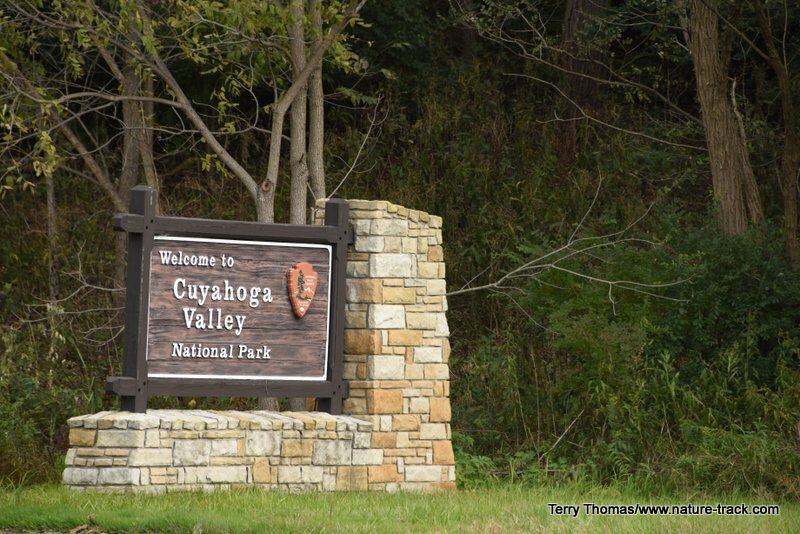 In the late 1970’s though, a group of citizens formed and pressured Congress into creating the Cuyahoga Valley National Recreation Area and restoration of the towpath began. 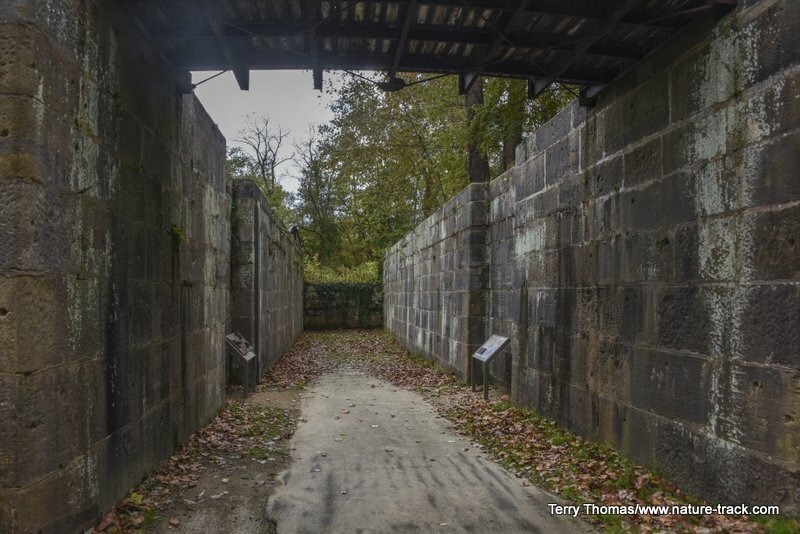 The recreation area became a national park in 2000, and the Towpath Trail has become the centerpiece of the park. 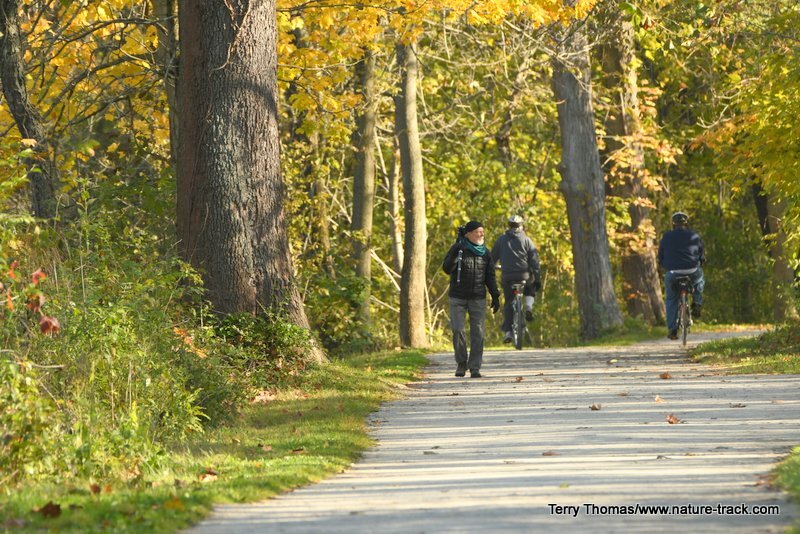 During the summer season, the Towpath Trail is a busy place full of cyclists, hikers and joggers. When we were there in late October, it was not crowded at all. 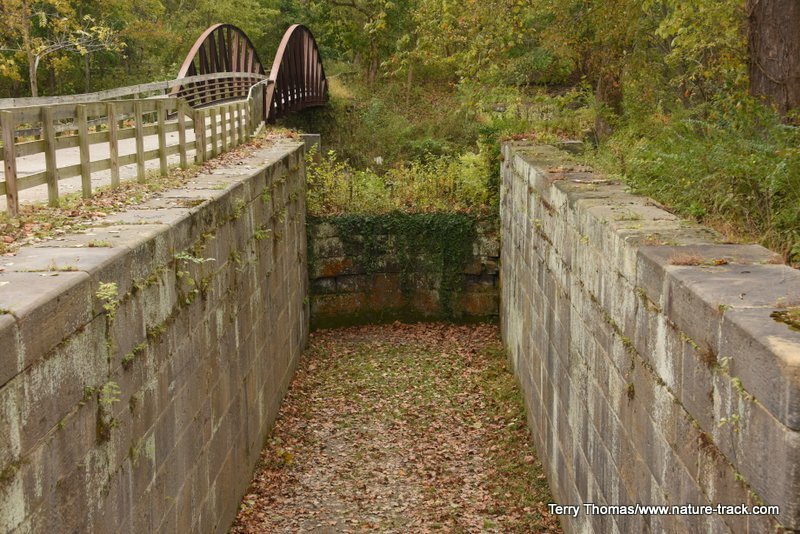 The Towpath Trail is as wide as a one lane road, flat and about 40 miles long. It is a beautiful biking and hiking trail with no motorized use allowed. It follows the Cuyahoga River and does not necessarily follow the original towpath, but some of it does. It is part of the Ohio to Erie Trail that will eventually connect Cincinnati in the south with Lake Erie in the north, a distance of about 320 miles (it is about 85% complete). Along the Towpath trail there are a few camping areas for long-distance travelers. There is no other camping in the park. There are a number of private campgrounds in the area, but no public ones that we could find. 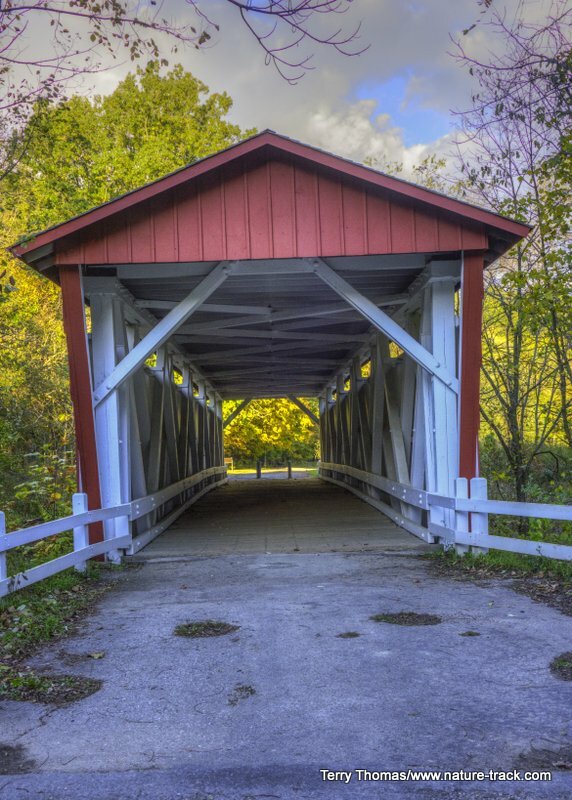 At one time, Ohio had more covered bridges than any other state, or so they claim. This is the Everett Bridge, destroyed in the 1913 flood and rebuilt many years later in original style. One interesting thing, one that we did not take time to explore this visit, are the farms run by cooperators with the Park Service. Some of these farms specialize in different types of crops and at least one uses horse-drawn plows to work the fields. 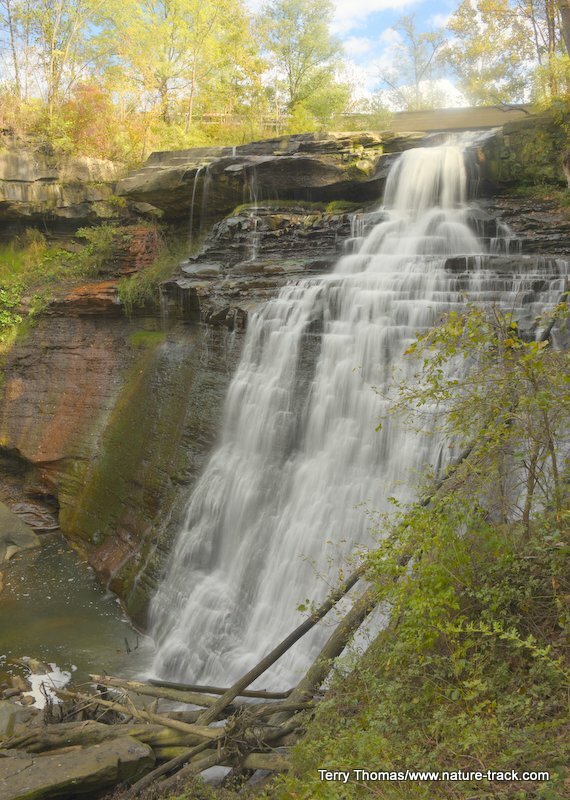 Besides history and the Towpath Trail, Cuyahoga Valley National Park is known for its beautiful forests and waterfalls. There are several waterfalls that seem to make every calendar and publication. The most impressive is Brandywine Falls. At 60 feet, it is by far the largest of the falls. There is a short walk out to the falls that entails lots of steps. Actually though, although I didn’t take the time to do it, it appears that the best view may actually be from the other side, off the highway just before the parking lot. I could see a trail there but no guardrail so I suspect the National Park Service discourages its use. 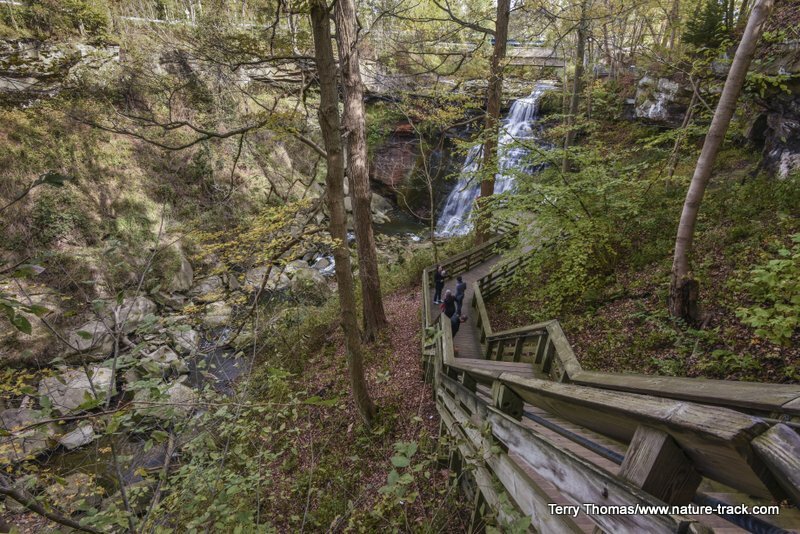 Brandywine Falls is beautiful with boardwalks that will take you to two different viewpoints. There are a lot of stairs though and things can be slippery when wet. 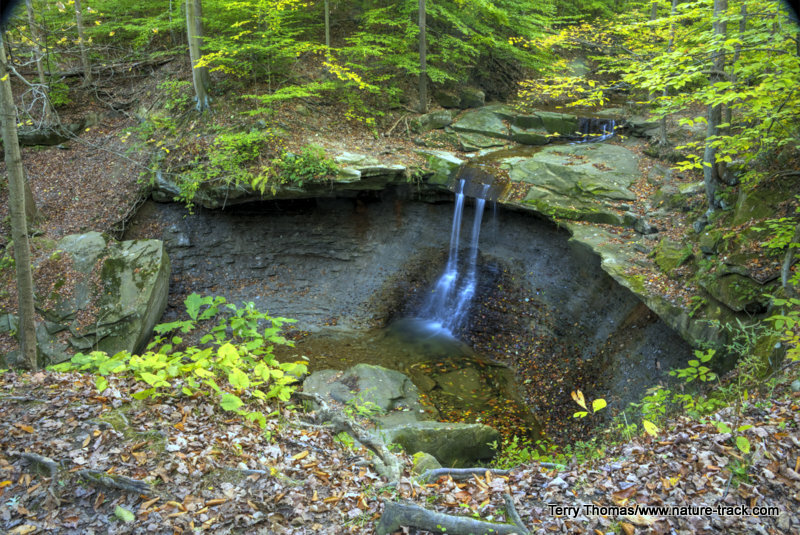 The next famous waterfall is Blue Hen Falls. This isn’t much size-wise, maybe 15 feet, but the setting is spectacular. Unfortunately, when we were there, this fall was running at a trickle. If you catch it in the spring during runoff or after an autumn storm, it will be much more impressive. You can get to the base of this falls by going past the overlook and scrambling down the short steep hill—about 20 yards. 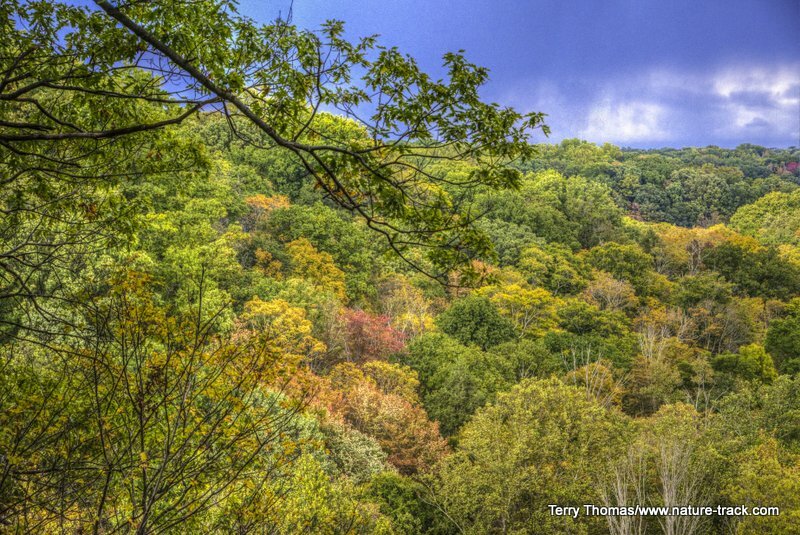 I would like to see Blue Hen Falls after a storm and when the fall leaves are changing. Photographically, I found that the forest was dark enough that I really didn’t need to use much neutral density filtration to blur the water. Between dropping my ISO down to around 100, and increasing my f-stop to something around f16-25 and adding a polarizer, I could get all the blur I wanted. The deep forest did create challenges if there was any wind though. There is one more waterfall that you shouldn’t miss if you are in the area. 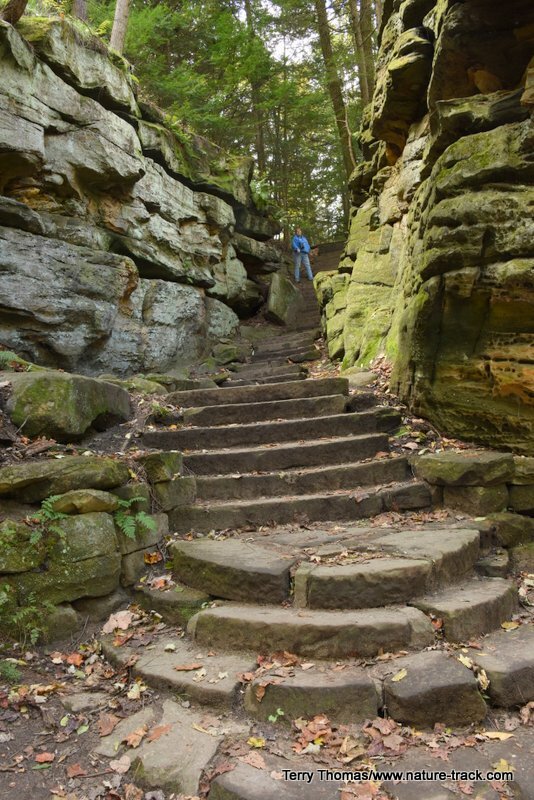 However, it actually isn’t in the Park, it is in one of Cleveland’s metro parks. 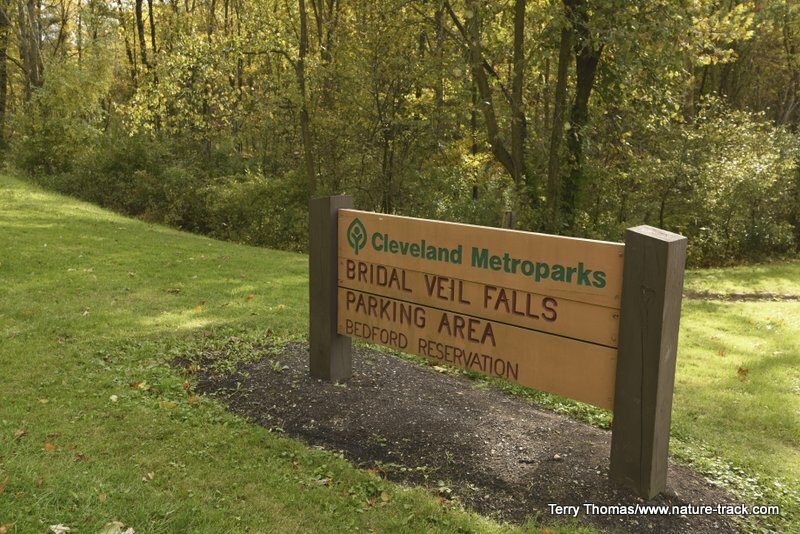 If you look at the map, you will see that the national park claims several metro parks as part of Cuyahoga Valley NP so there must be some sort of agreement between them. This one is called Bridal Veil Falls(there seems to be at least one in every state) and is just a short hike along a nice trail. This is more a cascade rather than a fall and again, we caught it when it was just a trickle. It shows a lot of promise though. This is Bridal Veil Falls at low water. It is better thought of as a cascade, and a small one at that. 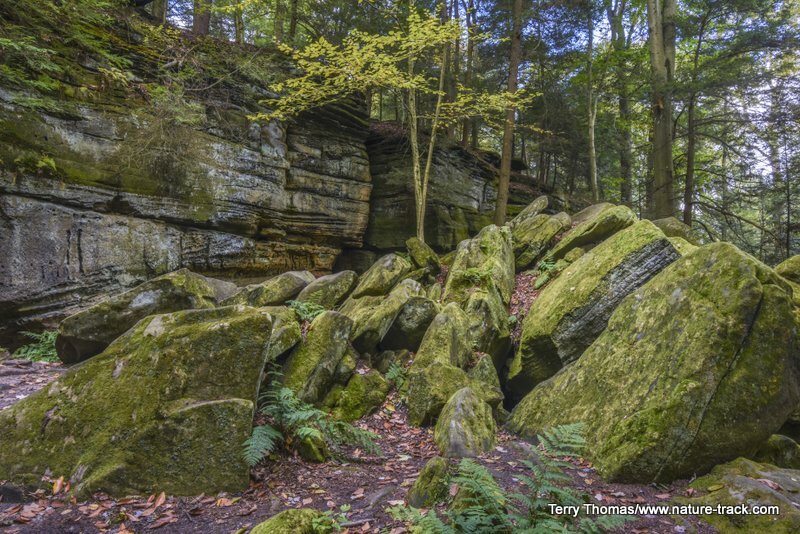 Cuyahoga Valley National Park seems to be all about hiking and biking. 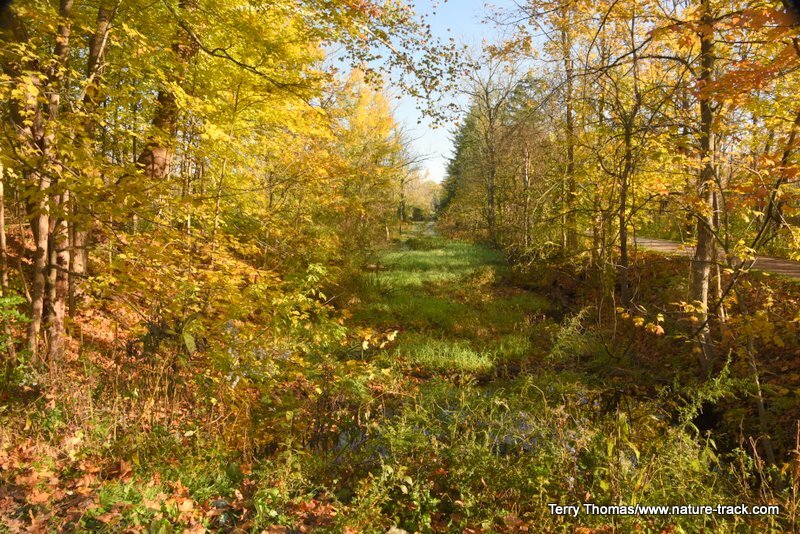 There are lots of hikes besides the Towpath Trail and we sampled several of them. My wife’s favorite was the Beaver Pond hike which is actually along the Towpath. I liked the hike out of Oak Hill into a couple of small lakes. There are lots of lakes and ponds in the park and every one of them is man-made. At one time, this park was all privately owned and these were likely farm ponds of different types. 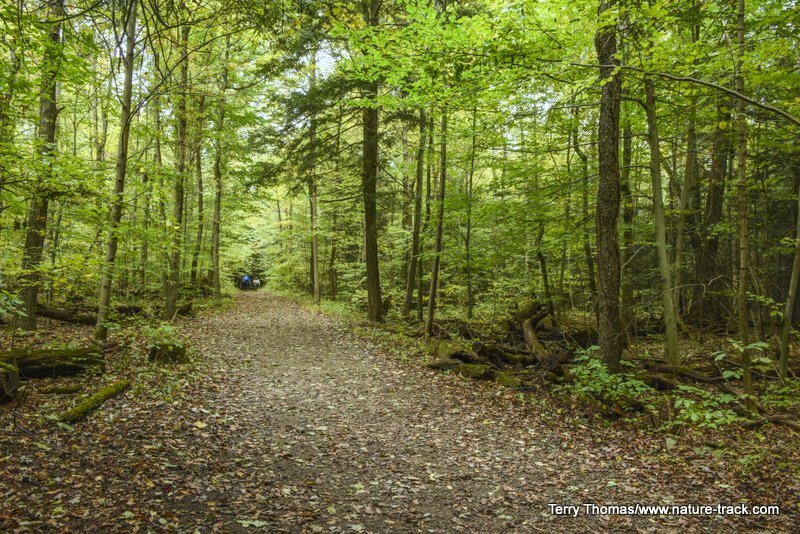 Trails are usually beneath arched canopies with a soft leaf litter underfoot. They are quite a pleasure to walk on. Wildlife really isn't plentiful in CVNP. 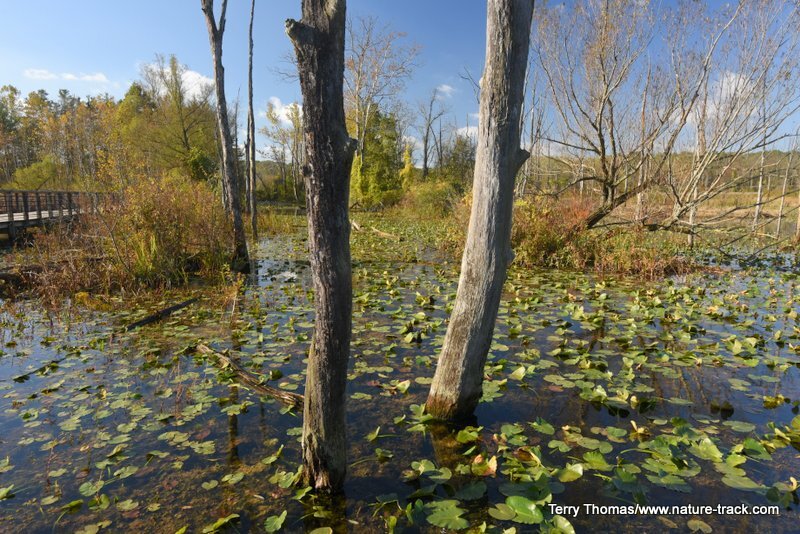 If you want a chance to see a variety of birds, mammals and amphibians, the Beaver Pond is likely the best place to go. 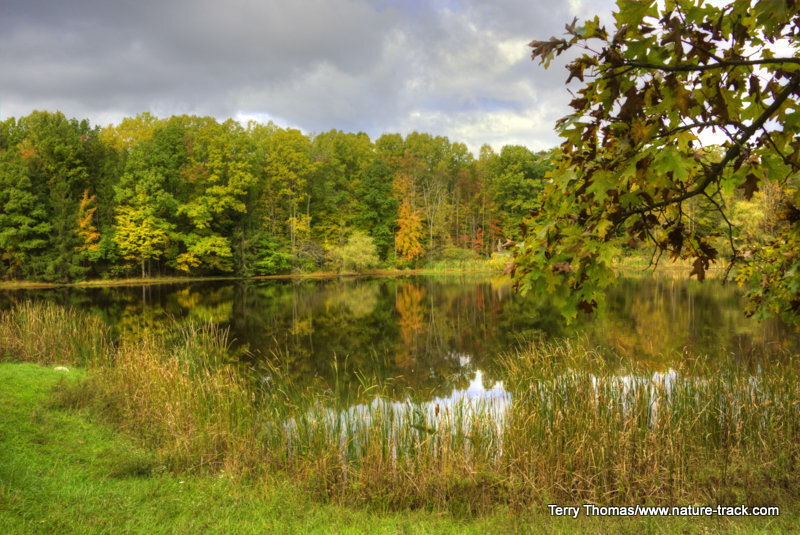 All of the lakes and ponds in the park are man-made, but they still provide beautiful photo opportunities. This small lake is on the Oak Hill Trail. 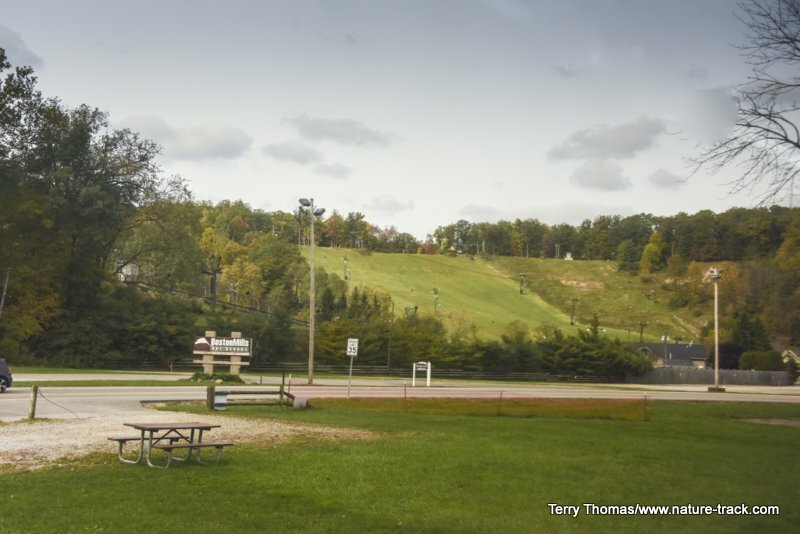 There is a “ski resort” called Boston Mills right in the middle of the park. I put it in quotations because from what I can see from the road, the only slope with a chairlift would hardly qualify as a bunny hill around here. Guess they have to make-do with what they have. As far as I can tell, this is the high point of the ski resort at Boston Mill. Maybe there is more to it that I couldn't see. 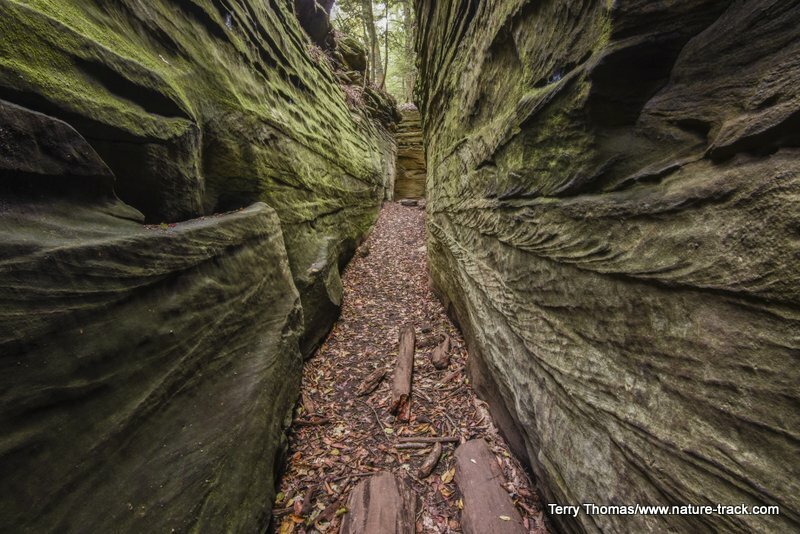 For me, The Ledges is the best place in the park. 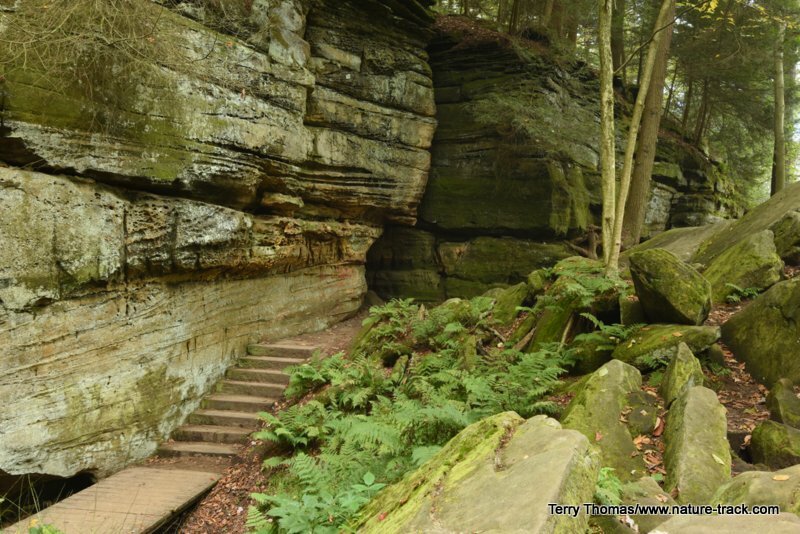 This is an exposed ledge of sandstone that has been worn into some really fabulous features. It is cooler and wetter there too so the moss and ferns are just awesome. Like everything else in the park, it is small, but I could have spent all day there. When our son Zack and his wife and daughter came to visit us while we were in Ohio, we took them to the park and I think they felt the same. 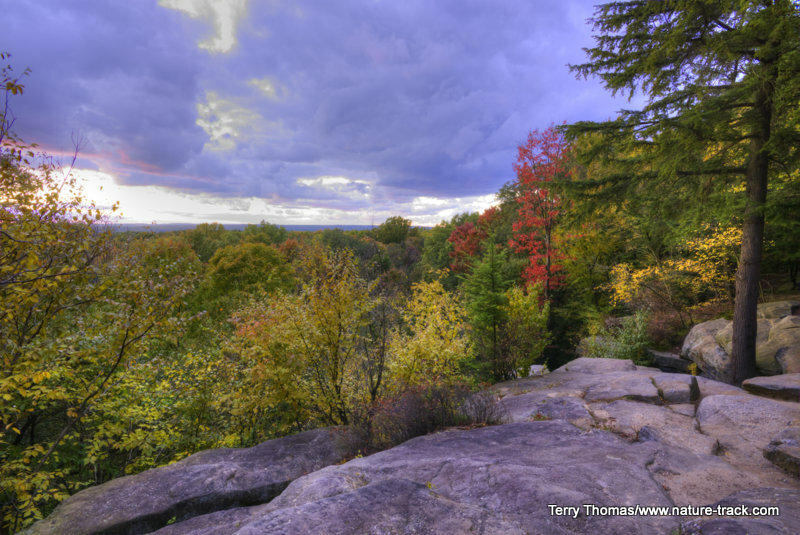 The Ledges Overlook. It is very popular for enjoying sunset. There is one other feature worth mentioning in the park and that is the train. 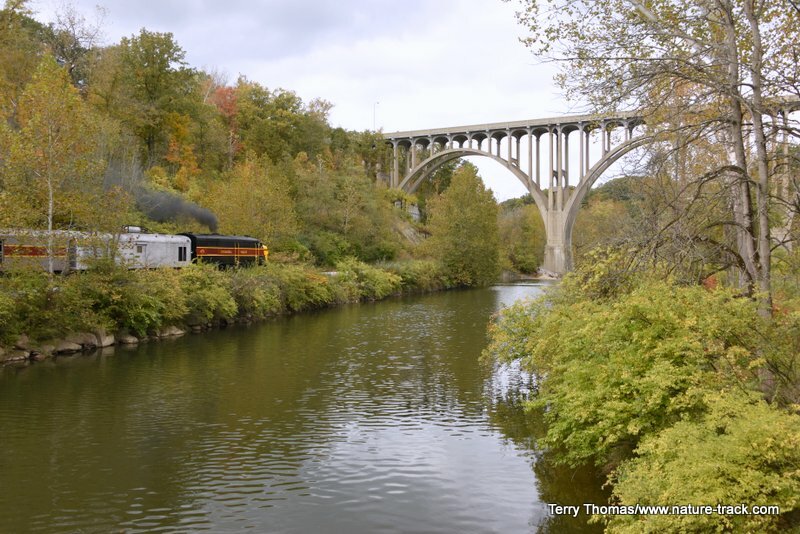 A passenger train runs from the top of the park to Akron and back each day. For $18 you can ride it all day long if you want. There are a number of whistle-stops where you can get off and explore and then catch the next train. And if you want to catch a ride with your bike to a jump-off point, that only costs $5. We rode the train with Zack and family and found that it was only ok. Most of the scenery is stuff you can see from the road so it was just a train ride. 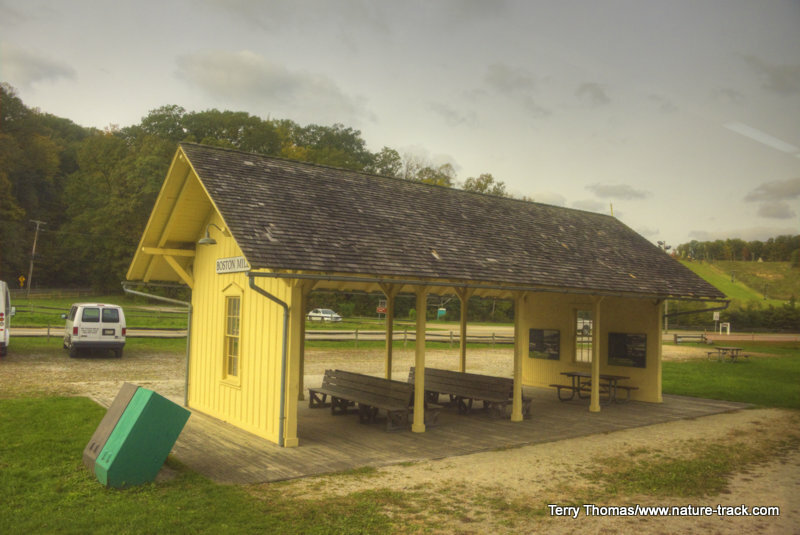 The Cuyahoga Train station at Peninsula. 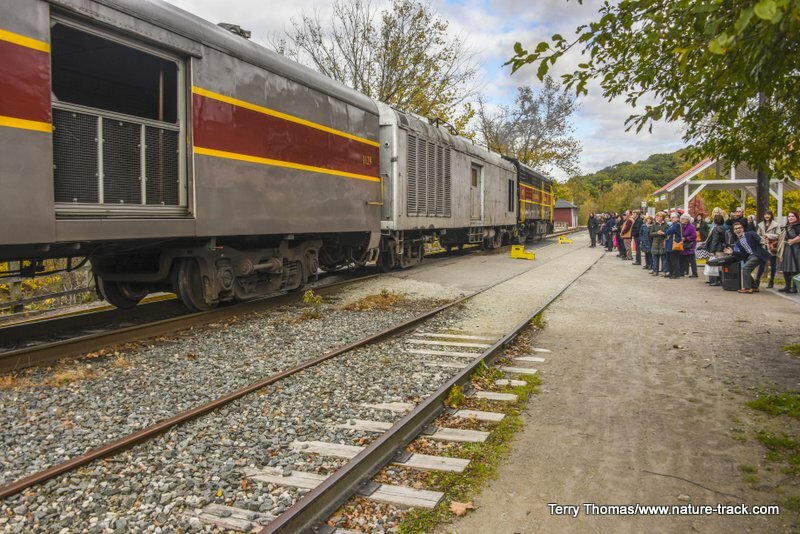 This train is a popular attraction and some people even use it as a commuter train. You are advised to get tickets in advance and be early to the station. There are at least half a dozen whistle-stops along the train route where you can get on and off the train. 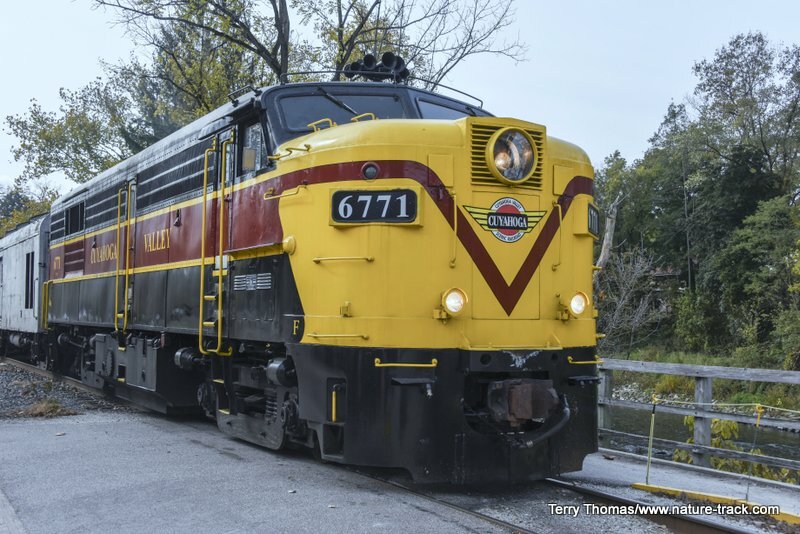 Would I recommend going to Cuyahoga Valley National Park? If I am in the area, I certainly wouldn’t miss it. I might go back just to spend more time at The Ledges. It is beautiful and interesting and full of history, but it isn't a wild park like our western parks and wildlife is not nearly as plentiful. I might not fly out just to see it, but if I am anywhere in the Cleveland area, I wouldn't miss it either.